The black siskin (Spinus atratus) belongs to the family of finches and siskins, the Fringillidae. 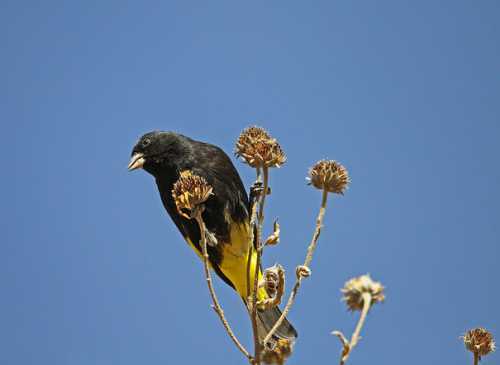 The black siskin is distributed over Argentina, Chile, Bolivia and Peru in South America. These siskin species inhabit high-altitude grasslands and shrublands in central Andes Mountains. These siskins are monotypic. The black siskin (Spinus atratus) is a small siskin, measuring 11 to 14 cm in length and weighing 15 to 17 grams. The adult male black siskin has glossy blackish plumage. There is a yellow patch on the folded wing and a yellow wing-flash. The tail is notched. The base of the tail and lower belly are yellow. The female has blackish brown plumage. The bill is conical and pale gray in color. The short legs and feet are grayish. The irises are blackish. There is a blackish eye-ring. Their call is a repeated, plaintive, twittering sound. 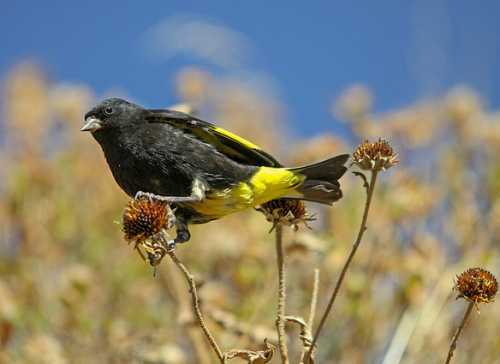 The black siskin is distributed over Argentina, Chile, Bolivia and Peru in South America. These siskin species inhabit high-altitude grasslands and shrublands in central Andes Mountains. These species do not normally occur in forests. They normally occurs in altitudes between 3500 to 4500 meters. The natural ecosystems and habitats of these species include tropical and subtropical high-altitude grasslands, tropical and subtropical high-altitude shrublands, rocky terrain, inland cliffs and mountain peaks. The diet of these species consists mainly of plant matter. Seeds of low-growing plants and bushes, berries and insects are their primary food. They forage on the ground and in low bush. The breeding season of these black siskin appears to be during November and December. Their nest is a tightly woven basket. The clutch contains three whitish eggs. These species are non-migratory, resident birds. The populations in higher altitudes may descent to lower altitudes in winter months. The global population size of the black siskin (Spinus atratus) has not been quantified. The overall population trend of the species is reported to be stable. In most of its range, this siskin species is reported to be 'fairly common but patchily distributed' (Stotz et al. 1996). The generation length is 4.2 years. Its distribution size is about 1,700,000 sq.km. Ecosystem degradation, ecosystem conversion and trapping of adults and juveniles for pet-trade are the main threats that may endanger the survival of the siskin species. The black siskin (Spinus atratus) species does not approach the thresholds for being Vulnerable either under the range size criterion, or under the population trend criterion or under the population size criterion. 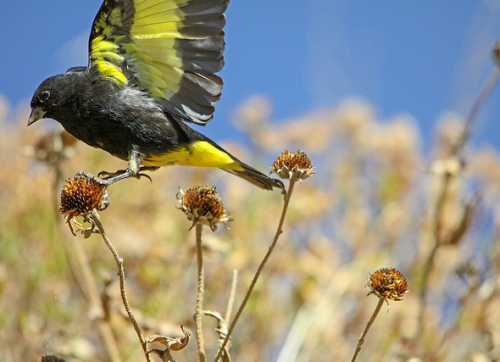 The CITES (Convention on International Trade in Endangered Species of Wild Fauna and Flora) status is ‘Not Evaluated’ for the black siskin (Spinus atratus). The Spinus atratus is closely related to the yellow-rumped siskin (Spinus uropygialis). Recently updated and current topic in Bird World: Black siskin - Spinus atratus with images.